… and his message is an inspiring one. Not only can he speak eloquently but he does so, every day. Whilst Trump and the republican guard stammer out strangled incoherences of bile and blethers, and Hillary offers up bland admonishments and pleas about her good record, Sanders speaks, often off-the-cuff with feeling. This is such a remarkable thing in contemporary politics people are just amazed, and moved. Whilst there are pitfalls from oratory, his is a blessing, tapping into and articulating the anger of ordinary Americans. Can you imagine the impact Jeremy Corbyn’s Momentum movement could make if he could string a sentence together? Someone, somewhere should be doing the same against the Bullingdon Junta and its travesty of failed elite rule. Sanders has gained endorsements of environmental groups, like Friends of the Earth Action, as well as the founder of the group 350.org, Bill McKibben. He has called climate change a “major crisis,” and speaks to it regularly as a core of his campaign. He endorsed a carbon tax and was an early opponent of the Keystone XL pipeline. It’s the single reason while the youth vote is going overwhelmingly to Sanders against Clinton. Sanders’ own New Hampshire communications director, Karthik Ganapathy, is on leave from 350.org. Ganapathy has gone on the record to say that it’s Sanders’ work on climate is what drove him to join the campaign. And Claire Sandberg, his national digital organizing director, previously worked on climate at the Rainforest Action Network. The Clinton team have been clear to attack Sanders for “over-reach”. The message is he can say anything he likes because he’ll never see office. The message is he has the voice but she can deliver. But the reality is that if Sanders can continue to build the sort of grassroots movement then he will be hard to defeat. The media have been focusing on policy and language but it is structure and means that is the key. The significant difference between Sanders and Clinton isn’t just outsider versus insider, radical versus moderate, it’s grassroots versus top-down. In a social-media connected world the network wins. Horizontal politics beats top-down even if you throw billions of dollars at it. This is a message corporate America hasn’t swallowed yet. And, as Alhan Keser writes, Bernie and his team are way-ahead of everyone on social media and website conversion. The era of hashtag politics is here. Added to this the Sanders message has resonance across class, gender and age, Clinton’s doesn’t. She has struggled to articulate an argument beyond gender empathy, or a now-tired Obama continuity ticket. That’s not enough to overcome her baggage. 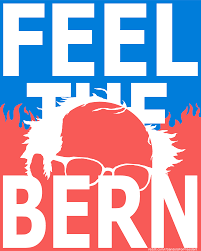 But more importantly the prospect of Trump does two things to boost the Bernie Sanders campaign. First it sharpens the latent focus of class and corporate antagonism every time The Donald opens his big mouth. Secondly it heightens the idea that Sanders might win. If he was facing a clever and broadly popular Republican opponent he might suffer, but in the binary conditions created by Trump, and with the prospect that Trump can’t reach out beyond his media-hyped bubble, it’s suddenly game-on. Credibility is absolutely crucial in the next phase of the Sanders campaign. Can he go from being an exciting stump speaker motivating Democrat voters to pan-American appeal? There are problems ahead though. 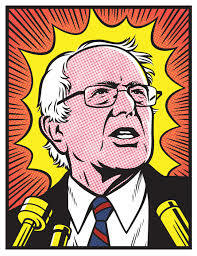 There’s no doubt Sanders weakness in campaigning terms is attracting black voters – an issue he is desperately trying to address – and in policy terms he is weak on foreign strategy – an issue he is vulnerable on and needs help with. There’s a second more sinister problem that hasn’t really been talked about. As Trump whips up a movement of right-wing Tea Party activists, racists and well-tooled-up Angry Americans – what will that crowd look like if it goes head-to-head against a self-professed ‘socialist’? In truth Sanders ‘socialism’ is mild and moderate. But in the eyes of Trumps followers, already unhinged and emboldened by his dangerous rhetoric this could be a toxic battle. These people are armed. Let’s hope whatever happens America’s political culture, and law enforcement is mature enough, and solid enough to contain a Trump mob. He has consistently voted for every war-mongering measure of the Obama regime. You’re kidding yourself to have any faith in this character. You think that the military / corporate /media elite will fix things with a bullet? Been done before ? Only because he has none but compared to the foreign policy of Obama and Bush before him, having none might be better than having one. American foreign policy since 9/11 has been one long horror story of incompetence, human rights abuses, and humanitarian disasters. I agree. Just what would be a good alternative is an interesting question and might be a hard sell to an electorate accustomed to a diet of fear and American exceptionalism. America, like the UK is a bitterly divided country. Both have neocon governments. Would be nice to see a social democratic leader in the US but somehow I can’t see it happening and a try socialist one is just out if the question. As the UK has demonstrated since Thatcher, march to the right is relentless despite the ever increasing disparity between rich and poor. That is why we need out of this rotten UK. And talking about the march to the right and the power of the superiority wealthy, isn’t it astounding how little coverage the BBC has given to Dr Adam Osborne being struck off for sexual abuse of a vulnerable patient. Not content with having extra marital sexual relations with his vulnerable patient, the good doctor then promised to make sure the woman, who took an overdose when he ended the affair would pay for exposing him and his family for complaining to the GMC. No doubt there will be many in the GMC who will now be in fear for taking the courageous step of striking off the brother of super rich Gideon Osborne. The BBCs relative silence is testimony to the reach and power of the rich. What chance in truth do the little people have in a UK like this. Saville screwed children and the dead – and Thatcher gave him a knighthood. Actually i did notice some strangeness on the news over the last couple of days , full of dead donkeys and fluff pieces , with the other bit on keeping politicians aleged crimes from the media being tested out. Plus the no charges against a copper for lying , including the one that wasnt even there for downing-gate. And of course more Irish stuff , including anniversaries of bombings and miscarriages of justice. But then again I usually have Euronews , RT and Alj running so may have missed some. Been a while since the done the banking bashing , actually missing it. Ooooh, he says we Americans are unhinged and armed, call the police, arrest those Americans so we can put in a Commie white-genocidal Jew for president. But careful with that American mob of unhinged Christian people with guns, they are scary. Guess what. We are scary, and we do look forward to the day when people can’t so easily spread Anti-American hatred and incitement to violence towards us. Those people will be pinpointed one day, the same way people like myself are pinpointed by them. Time to take responsibility for their part in drumming up war against American whites. Wow Bryan, well done in convincing us that you are NOT unhinged. C Rober it,s a pity that Keiser/Stacy can,t get more air time both brilliant if you can get into it. I think it is Saunders’ education policies that are more important to young voters in the US. Eisenhower had the MIC’s potential for corruption all figured out in 1961. In some ways Bernie isn’t much of a revolutionary. Right or Left, politicians are all believers in the ever-expanding administrative state. I would prefer the important things in my life, healthcare for example, to be administered by organisations answerable to me and my fellow citizens, rather than to capital. What would you prefer?